Such as disjointed eye sockets? 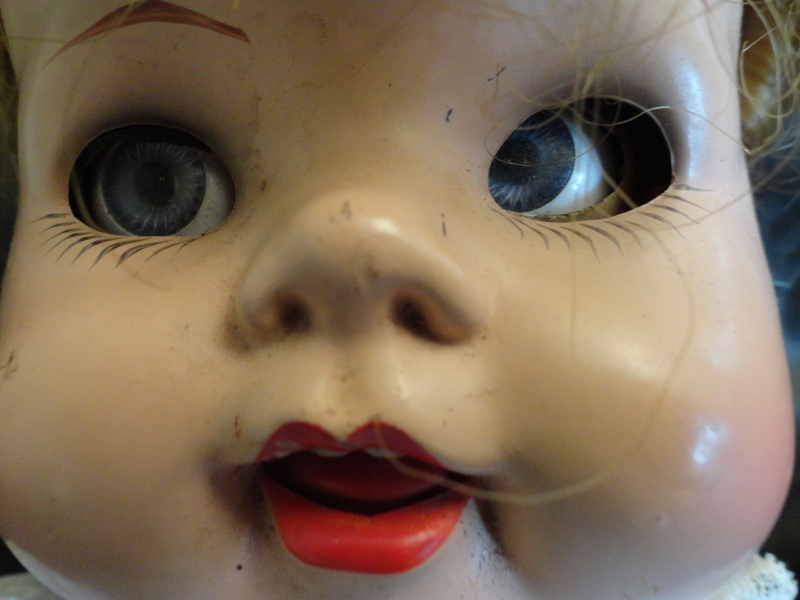 It’s a common malady in elderly dolls. I hope it doesn’t happen to me in my dotage. Ha! I’m just hoping my stuffing doesn’t come out. I love this story. My dolls were so important to me. This post brings it all back. My favorite doll got passed to my daughter, and then to her daughter. I hope she’ll live to bring joy to another generation. My husband’s daughter pretty much destroyed my dolls.. at least their wardrobes–cutting them up and losing shoes. I brought what remains with me and now have recently brought them out for Yoli to play with. Must admit I was up the other night at 2 a.m. changing their clothes and getting their closet organized. Yoli hasn’t been back since, so order is somewhat restored! I’ll take a photo. I would love to do a museum installation with them but balk at doing the groundwork that makes those things happen. in terms of applying for shows and grants, I mean. I love doing the actual work. And meanwhile, I have at least 200 dolls, all antique and in good condition. I don’t suppose you’d like a few dozen? I had a Suzy walker doll. I loved her. Is that the name of this doll? I don’t think I ever named her, actually.